The 10 µm scale bar applies to all figures. Figs. 1-6. 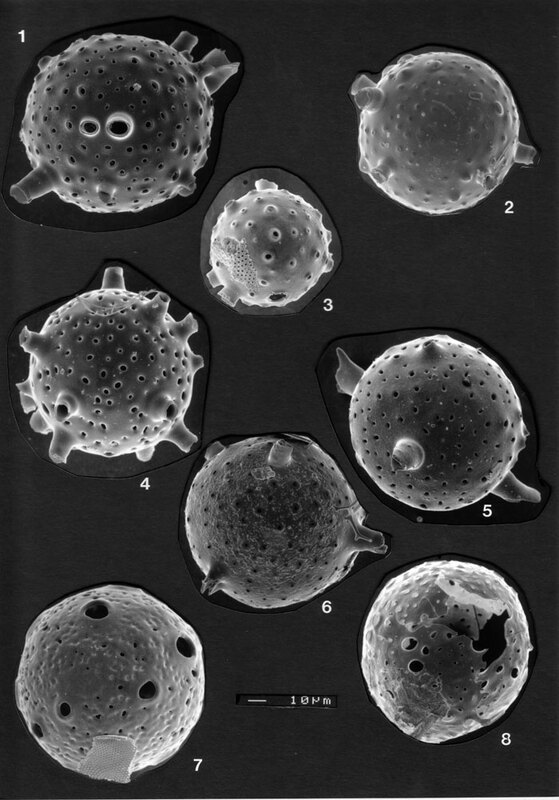 Merosiphonia socialis , showing wide range of morphological variability, including differences in shell size and thickness, relative pore size and pore size distribution, type of tubes and tube-mouths, and difference in type of pore rim. BSS 28B(VIII, spec nrs. 772, 952, 839, 1029, 1007, 987). Figs. 7, 8 Merosiphonia magnisphaera . Fig. 7: thickwalled variant; fig. 8: thin-walled variant. Note piece of diatom frustule attached to the shell. BSS 28B(VIII/1048 and 760).